The VC, Prof. Olusola Oyewole addressing participants of the 3-day Workshop while the DVC (D), Prof. Felix Salako (Left) and Prof. Francis Sowemimo listen with rapt attention. 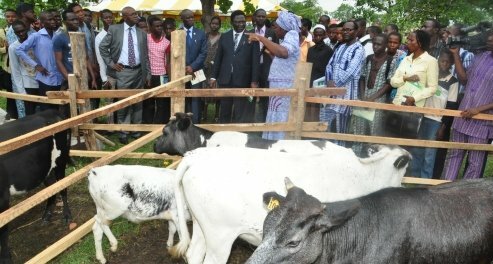 The Vice-Chancellor, Federal University of Agriculture Abeokuta, (FUNAAB), Professor O. B Oyewole, has described graduates of the University as standing out among equals. Prof. Oyewole made this declaration during the Opening Ceremony of a 3-day workshop organized by the FUNAAB Universal Conservices Limited (FUCONS) in collaboration with Integrated Media Concept (IMC) Limited. Declaring the workshop open, the Vice-Chancellor noted that the training in geographical information system and remote sensing was imperative for today’s society, which according to him “will help in developing intelligent solution to the revolving social problems”. Earlier in his Welcome Address, the Director, FUCONS, Prof. Francis Sowemimo, enumerated FUNAAB’S achievements with its recent ranking by Cybermetrics as 2nd in Nigeria and 35th in Africa.